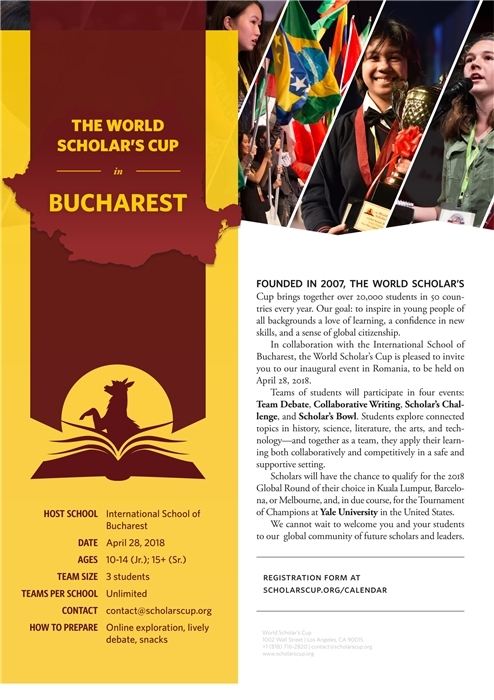 The International School of Bucharest is proud to be hosting the World Scholar’s Cup inaugural event in Romania, on Saturday, 28th April, 2018 starting 8.00am. 40 students from ISB will be participating in this competition, which brings together every year since 2007, over 20,000 students from 50 countries . We will also welcome to ISB a school from Albania; the school will join the competition along with teams from the International Computer High School Bucharest. This year’s theme is Entangled World. Teams of students (ages 10 to 18) will participate in four events: Team Debate, Collaborative Writing, Scholar’s Chal­lenge, and Scholar’s Bowl. Students explore connected topics in history, science, literature, the arts, and tech­nology—and together as a team, they apply their learn­ing both collaboratively and competitively in a safe and supportive setting. Scholars will have the chance to qualify for the 2018 Global Round of their choice in Kuala Lumpur, Barcelo­na, or Melbourne, and, in due course, for the Tournament of Champions at Yale University in the United States. The World Scholar’s Cup’s goal is to inspire in young people of all backgrounds a love of learning, a confidence in new skills, and a sense of global citizenship.